More than 35,000 faithful Star Wars fans are expected to descend on the celebration each day at McCormick Place to take in exclusive merchandise, actor panels and perhaps the "Episode IX" trailer. Though tickets are mostly sold out for this weekend's immersive, five-day "Star Wars Celebration" in Chicago, fans can find other ways to celebrate in the city thanks to a series of after-parties and side events. 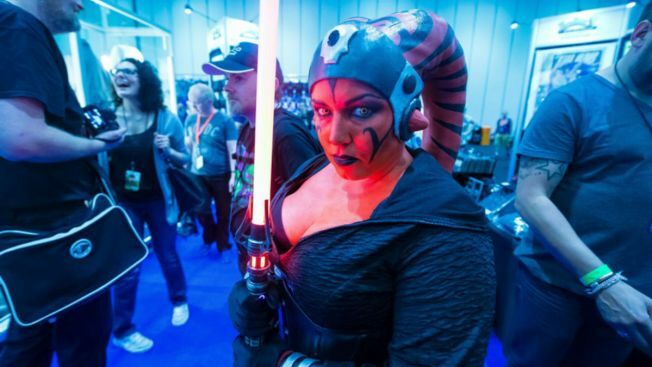 More than 35,000 faithful Star Wars fans are expected to descend on the celebration each day at McCormick Place to take in exclusive merchandise, actor panels and perhaps the "Episode IX" trailer. Some passes are still available for Monday. Rogue Squadron Podcast and Motor Row Brewing host the "Star Wars Celebration After Party" starting at 6 p.m. Friday at Motor Row Brewing, 2337 S. Michigan Ave. The beer- and themed-drink-focused fete features live podcasting by Rogue Squadron Podcast, San Diego Sabers, Talk Star Wars and Force Toast Podcast. Though the event is free, organizers ask attendees to RSVP ahead of time. The "SWCC Craft Beer Meetup" is billed as a place for fans to meet and mingle while sipping special brews. Held from 6:30 p.m. to 9 p.m. Friday at the C.H.A.O.S. Brew Club, 2417 W. Hubbard St., attendees are asked to "bring unique beer to share and trade." The party is limited to the first 50 guests. Vader's Vault and Motor Row Brewing invite Star Wars fans to "handle some of our sabers and maybe even take one home, or just hang out with fellow Saber enthusiasts" at the Vader's Vault Meet and Greet. The event runs from 7 p.m. to 9 p.m. on Friday at Motor Row Brewing, 2337 S. Michigan Ave. Bonus: Vader's Vault will buy the first round for the first 25 people. The Saber Legion hosts "Saber Celebration Meet & Greet" at 8 p.m. Saturday at Pizano's Pizza & Pasta, 2106 S. Indiana Ave. "Meet up with your fellow Legionnaires for some Chicago style pizza and drinks." Guests are asked to RSVP ahead of time. Meet at The Bean, 1 N. Michigan Ave., at 8:30 p.m. Saturday for a good old-fashioned Saber battle. Attendees will split into two sides at 8:55 p.m., and the battle begins at 9 p.m. "The girl in the Wookiee dress will announce the start," organizers say. Photographers welcomed: "The reflection off the Bean will be incredible!" Yep, you read it right. The bellydancing Wookiee performs at Replay Lincoln Park, 2833 N Sheffield Ave., at 9 p.m. Saturday in the arcade bar's Back Room "for a special geek bar show during Star Wars Celebration weekend." Admission is free. Organizers say: "Grab a drink at one of Chicago's finest arcade bars and nerd out with bellydancing, firespinning, poi dancing Sith Lords, Kylo Ren, Stormtroopers, C-3PO, and more."